Ask most people about soldiers, surf and poisoned arrows and they will immediately think of Apocalypse Now. But long before the Vietnam War lived an Englishman who redefined the idea of madness. He was born John Malcolm Thorpe Fleming Churchill, in 1906, but preferred the simple moniker Jack. After school he attended officer training at Sandhurst and was commissioned into the Manchester Regiment. The route to becoming an officer was conventional - Churchill, however, was anything but. Churchill was one of the first people to attempt to cross the Indian continent by motorbike, his 1927 effort ending when he rode into a water buffalo. He also learned to play the bagpipes while seconded to the Cameron Highlanders, and would frequently pipe in the orderly officer when he arrived at the guardroom... at 3 o'clock in the morning. In 1936, frustrated by peacetime army routine, Churchill resigned his commission. He spent the next few years travelling and honing his archery, a sport he had taken up in-between postings. In 1939, he was chosen to be a member of the British team for the World Archery Championships in Oslo. It was his love of the bow and arrow that really brought Jack to the public eye. When WWII broke out he was enlisted into the British Expeditionary Force and left for France with a custom made bow from Purle Of London. While most soldiers trusted their lives with a Lee Enfield, Churchill's weapon of choice was centuries old. 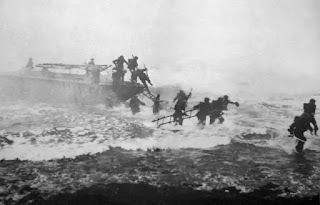 On May 27, 1940, at L'Epinette near Bethune, Jack Churchill became the only man during WWII to shoot dead an enemy soldier with an arrow loosed from a longbow. Alongside the Yugoslavian Partisan Star, awarded by Tito for resistance work, Churchill also won the Distinguished Service Order and the Military Cross for his selfless actions with the Commandos in Italy and Norway. By now he had dispensed with his bow and travelled into battle playing the pipes, his favourite tune being "Will Ye No Come Back Again?" Later in the war Churchill was captured on two separate occasions by German troops. He escaped both times. However, it is in his last famous public action that Churchill's motto for life was finally revealed. On July 21, 1955, he became the first man to surf the tidal Severn Bore near Gloucester, on a 16ft Australian-style surfboard he had made himself and taken to the river on the back of his Black Widow motorbike. As he stood in the water, onlookers tried to persuade him of the suicidal nature of his venture. The Evening Standard reported that Churchill looked at them, laughed, and said, "I will be all right". That mile-and-a-half trip was 'mad' Jack Churchill's last big adventure, but he lived on long afterwards. He died in 1996 aged 89, appropriately enough in the month of March.Ask most people about soldiers, surf and poisoned arrows and they will immediately think of Apocalypse Now. But long before the Vietnam War lived an Englishman who redefined the idea of madness. That mile-and-a-half trip was 'mad' Jack Churchill's last big adventure, but he lived on long afterwards. He died in 1996 aged 89, appropriately enough in the month of March.